This post is easily a year in the making, so bear with us because it is a long one. Tons of pictures and lots to say – I’d grab a beer ahead of this and set aside a bit of time. When I (Whitney) initially signed onto the project with Alex and Olly, we truly only had a color flyer and a lot of enthusiasm as our main ingredients to restoring the cabinets. 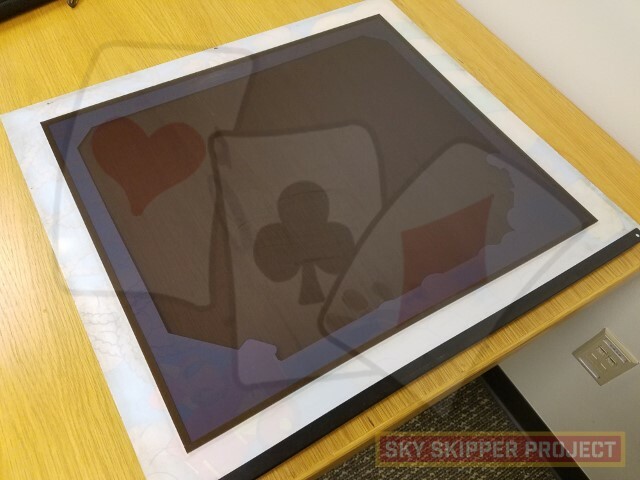 Olly had done a tremendous amount of work with the artwork available at the time (which will be fully-detailed in a forthcoming post about the journey the artwork itself has taken) and we felt we could piece together some of the missing details to flesh out a passing example of what we thought Sky Skipper would have looked like. The fact remained, however, that despite our best efforts, we were shy any real details that would allow us to finish this project with any semblance of historical accuracy. In short, until any better option came along, we were going to have to make some stuff (s**t) up – and we didn’t want to do that at all. 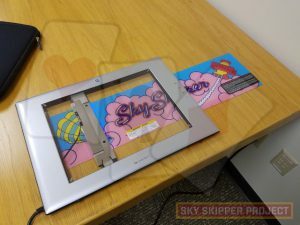 For all that Sky Skipper is – and never was – it deserved better. So that is where our story begins…how to get access to the full (and correct) cabinet artwork in order to recreate it for our games. Back in November of 2015, I had contacted Alex to do an interview for my podcast. 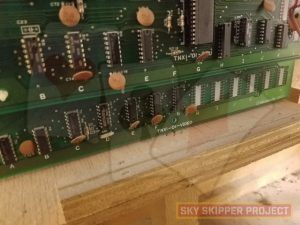 This was shortly after the news broke to the world that not only had he acquired these two Sky Skipper PCB sets, but he had them fully-working as well. Upon hearing that news, I was instantly hooked. I thought to myself – “I HAVE to talk to this guy” and I made it a point to reach out to him to see if he’d be interested in talking to me about the game in general and the story behind PCB’s specifically. I immediately found Alex to be very approachable and knowing that I was just another voice in what was sure to be a sea of folks knocking on his window for attention, he was very gracious and agreed to do the interview with me. We set up a time, hopped on Skype and proceeded to talk. By the end of the conversation, I knew I wanted this game – both from a rarity perspective as well as a challenge perspective AND the historical perspective… this was a project that NEEDED to be completed, and I was immediately consumed with the idea of seeing if I could help to complete Alex’s vision. I think that everyone in this wonderful hobby wants the same thing – and that is to give something back; contribute to history and the preservation of knowledge and ensure that these rare artifacts live on to be enjoyed for years to come. I felt as if this was the perfect opportunity to combine both that desire and my love for Nintendo (and their arcade legacy) to help tackle what felt like an almost impossible task – find the game that was never released (documented only in a few pictures over the past 35 years) and use it to restore two games that were never intended to exist. Although I’m nowhere close to the most prolific Nintendo collector out there, I figured that I could help bridge the gap between the era and types of games that Alex focuses on and the more common arcade games that are found in most other collections. 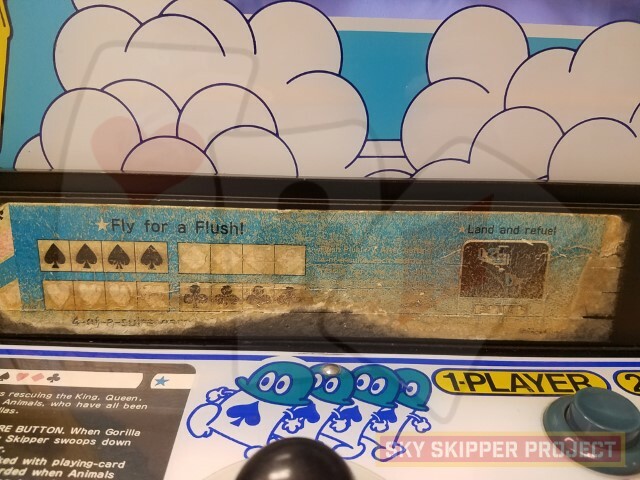 There are many great collections and excellent ‘Nintendo Row’ lineups that I see on KLOV and elsewhere that I feel my collection likely isn’t all that worthy in comparison, but Sky Skipper would be the right game with the right lineage to make some amazing happen. So not overly huge and certainly not complete. What it is, however, is what I consider to be a great sampling of the ‘golden age’ games leading into the 90’s schmups (with R-Type) and I love each and every one of the titles. So with that, Alex and I went back and forth several times in discussion before we both formally committed to this project and seeing it through to success. 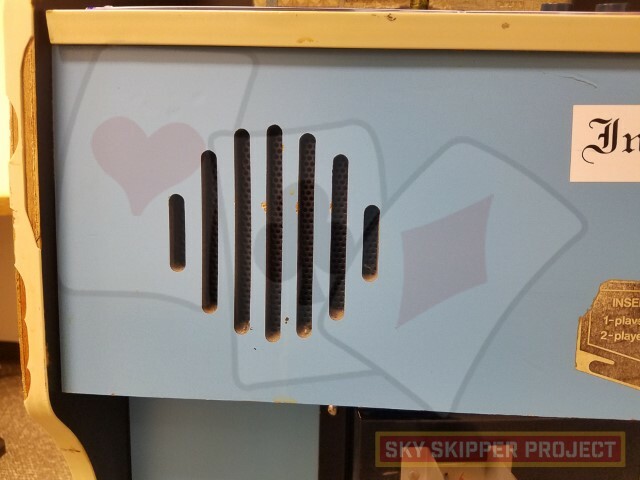 We both knew that the only way to accurately restore our games was to get access to a finished Sky Skipper cabinet so we could answer all of the outstanding questions we had about the artwork and cabinet design. Based on what little (confirmed) history we knew of the game at that time, getting access to a complete Sky Skipper felt like an impossible task. Considering the fact that a complete game hadn’t been seen for over 35 years, our hopes for putting our hands on one for reference were slim-to-none. While Olly stood ready to help us with the artwork, the sad reality of our situation is that we truly had nothing to work with outside of the flyer and a very low-resolution picture of the cabinet. Realistically – we needed (a lot) more if we were to complete this at any point in our lifetime and with any hopes of being historically accurate. So, what do you do when you have no real options and no real avenue for doing the impossible? Over the next several months, Alex, Olly and I would hold regular Skype calls and discuss our options and the results of our research efforts. 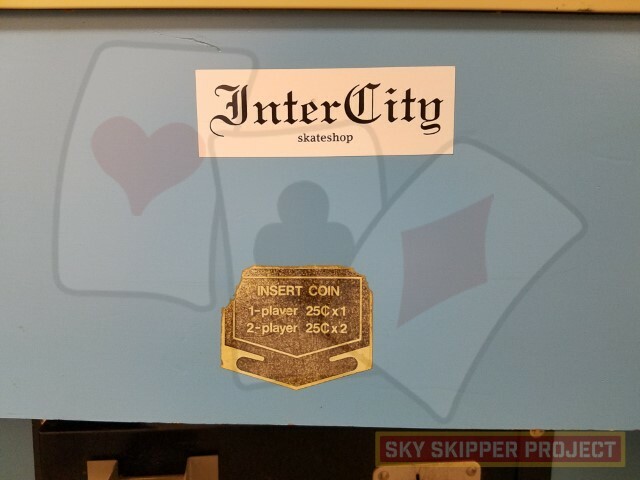 Knowing the game ROMS were at some point in the past dumped for inclusion into MAME (more on that story in another upcoming blog post) we knew that there had to be at least one working example of Sky Skipper somewhere along the line. Armed with that assumption, we figured the best way to determine whether that (or other) copies of the game might still exist would be to find someone with first-hand knowledge of the game back in the day (BITD). The big question on our minds was who, specifically, would that be? The normal avenues (collector forums, eBay, etc.) were of little help due to sheer lack of confirmed information, so we knew we had a challenge in front of us. Alex rolled through his pretty-extensive list of contacts, but we received the same result – what little was known, we already knew and there didn’t seem to be anything else to go on. With that, we finally settled on the fact that our best bet for any new information on the game would best be gathered straight from the source – NOA. 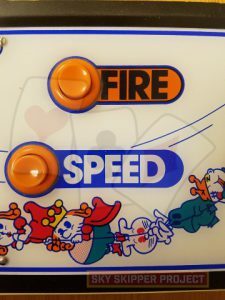 Arcade legend states that this sole working example was located in the Nintendo of America break room back in the early/mid 80’s. So – that’s a lead. The only problem that Alex, Olly and I had is that we were some 35 years late to this party and we figured the odds of that machine (or any other copies) existing today were somewhere between slim and his brother none. Consider this – of the literally thousands (60,000 according to Wikipedia) of original Donkey Kongs produced back in 1980/1981 how many complete examples exist today? Some – maybe even up to a couple thousand) but not many in relative terms. Knowing that Sky Skipper was never released, we had little hope of actually seeing one today…It felt like our only real option was virtually non-existent, but we had to try – it was the only (best) option we had, so we decided to chase it as far as it would take us. We tried contacting everyone we knew (or could find) that presently works at NOA. Searching Facebook and LinkedIn yielded a few potential options and we reached out to them all telling our story and what we were trying to accomplish and asking for help – if nothing else – just confirming what we thought was fact. I had a few collector friends refer me to KLOV members that still work at NOA today and I reached out to them, as well. All of those e-mails, PMs and phone calls went unanswered and we wound up with a big, fat zero. A couple of months of effort down the tubes and we had little to show for it other than a lot of sore fingers typing out a lot of questions and nothing in return. 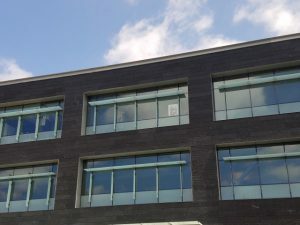 My work will periodically take me out to the Seattle area and knowing that NOA is in that vicinity, I talked it over with Alex and we agreed that it might be good to visit just to check the place out and see if anyone there would help us if we made that personal connection. 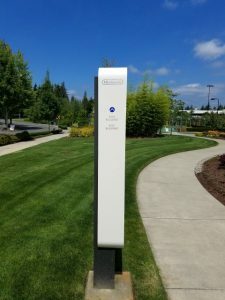 We decided that a viable next step was to try and meet a few people that we had names for (and knew were still working there) and see if we could make a connection in person and at least begin a conversation. 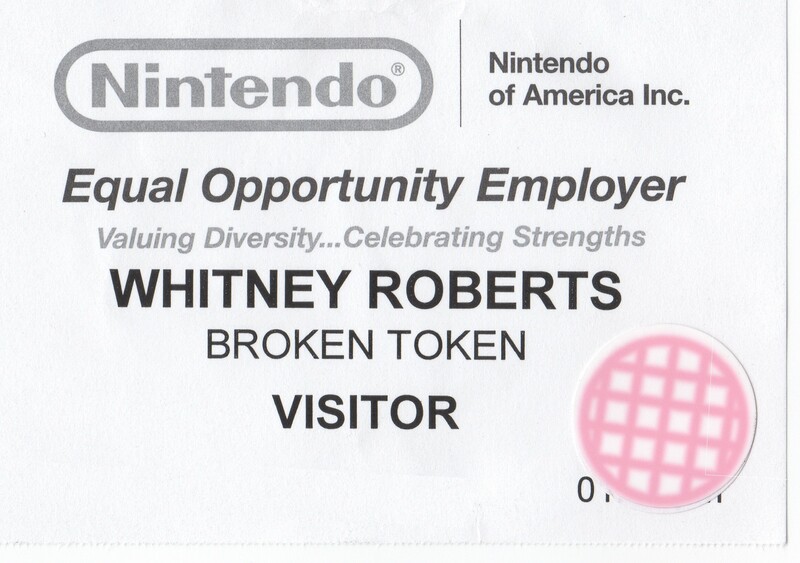 So in Feb 2016 I went to the NOA campus and checked into the visitor center and asked to see if I could talk with a few of the names we had and a company historian. Truthfully – I didn’t expect much making what was essentially a cold-call. Unfortunately, I got exactly what I bargained for – which was absolutely nothing. 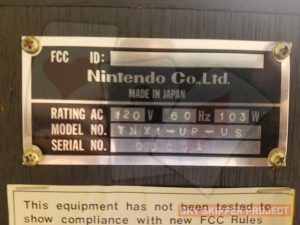 I was referred back to the general Nintendo repair hotline (which wasn’t going to be of much use to us) and was systematically shown the door. Even if they knew what I was asking about, no information was forthcoming and I now knew we weren’t approaching this in a way that was to yield some success. We needed to re-group if we were to ever figure this out. Remember that help I mentioned a few paragraphs back? Yeah…well this was the time to enlist that help and get some additional resources to bear, because we weren’t making any real headway by just asking around. We needed to get in touch with someone who was there BITD and who might know some people at NOA that we could get referred into and have a chance of them talking to us about Sky Skipper. Alex, Olly and I batted it around a bit, and we figured the best guy to talk to was none other than Billy Mitchell. 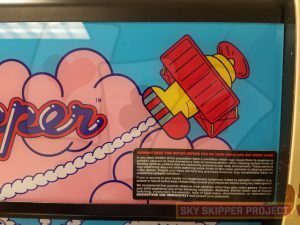 We figured that if anyone might know some (undocumented) history on Sky Skipper it would be him. Rumor had it he had visited NOA back in his Pac-Man world tour days and we thought him to be the next logical step in figuring out this puzzle. The problem, however, was getting access to him. 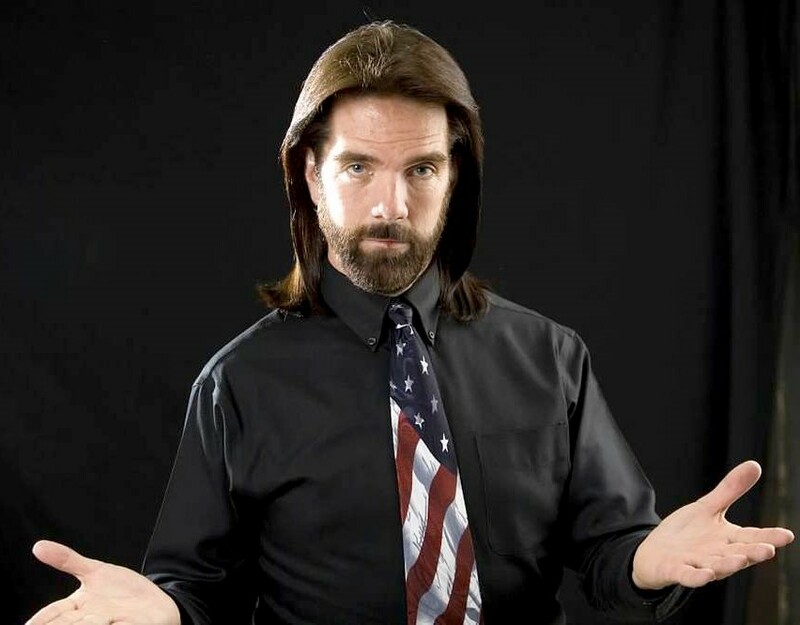 Wanting to talk to Billy Mitchell and getting Billy Mitchell to answer the phone are two different scenarios altogether and we needed the latter to happen, despite the former. It was now early March 2016 and the months had been ticking by and we were all getting anxious….we needed a way to get in front of Billy to make that initial contact. However, you don’t just “call” Billy Mitchell and ask him for a favor, so we needed a formalized introduction. I was attending the Louisville Arcade Expo (where Billy was doing seminars and promotions as well) and I was fortunate enough to catch him for a few minutes to chat with him. I pulled him to the side and him if he’d be interested in helping me with a historic arcade documentation and restoration project. I could tell that despite his graciousness, it was likely a request he gets a lot. After chatting for just a few short minutes, he confirmed that he’d be willing to talk with me and said to get in touch with him and he gave me his phone number. At that point, he was being pulled in several directions at once (the crowd never seems to leave him alone) and I didn’t want to press my luck much further by talking about the project in front of so many other people, so I took the info, said “Thank You” and went about my business. I didn’t really expect to walk away with Billy’s phone number – but hey – who am I to complain? Over the next few weeks, I tried calling him and leaving a few voicemails but didn’t get much in return. Truthfully, I didn’t expect much different – at this point, I was just another guy wanting another favor for an unknown project of dubious pedigree and nothing was in it for him in return. I felt like he gets that type of request a LOT. However, I also felt that if he knew the details behind our request, he’d see the value in the ask and give it due. 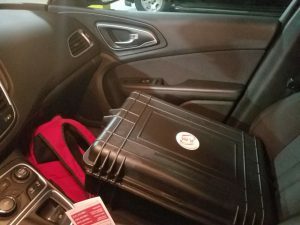 Despite all of that, I didn’t hear back and felt that I needed another way to get his attention – I needed to get someone who knew him well enough to proxy the request so that we could get a return call. I knew exactly who to ask, so I reached out to my friend Cary Chaney and called in a favor. 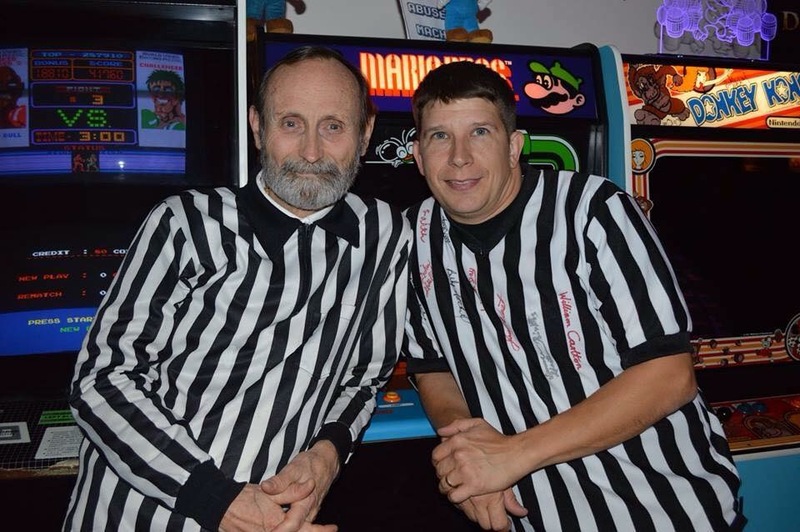 Cary on the right, Walter Day on the left… or is it the other way around? I can’t tell. 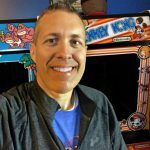 If you aren’t familiar with Cary – here’s a quick sidebar: He used to run an excellent family-owned arcade known as “The Place, Retro Arcade” in Cincinnati, OH. During the years it was open, he would regularly have Billy, Walter Day, Joel West and Richie Knucklez (and others) at the arcade for various events and I knew that over the years Cary and Billy had developed a good relationship. Once on the phone with Cary I gave him some background on why I needed to talk to Billy and asked if he could help me get a return call to discuss our project. Cary said he would do what he could and to give it a couple of days. Cary’s timing was spot-on, because it was just a few days later when my phone rang with Florida area code. I almost dumped it to voicemail due to not immediately recognizing the number, but at the last second I decided to answer and said Hello. The voice on the other side said (as only Billy Mitchell can do) “This is Billy Mitchell and I hear I need to talk to you.” And then it was stone-cold silence as he waited for me to say something. It caught me off guard. I had to do a quick mental collection of EVERYTHING that had transpired leading up to that call and quickly responded with “If I tell you what I’m working on, do you promise to keep it a secret until we are done?” A few seconds later, I got back a “Yes”. I could tell he was testing me a bit, but that’s OK… I was still in that ‘unknown’ category. I chose my next sentences carefully and laid out a bit of the history of what we were attempting to do and as soon as I mentioned the words “Nintendo’s Sky Skipper” the silence broke. Billy started talking and the information started flowing. I could almost feel his eyes focused hard on me through the phone and he said … “You know I played that back at NOA in 1982. It was in the break room. Right next to a Mario Bros. that Frank Ballouz and I used play head-to-head against anytime I was at NOA”. Right then I knew we had hit pay dirt. Not only had Billy seen the game, he had played on it and confirmed what we had previously could only assume to be true. With just one sentence, the project leaped forward significantly. We had confirmed the game actually existed in a playable form at some point in the past AND it had sat on American soil. That was the ice breaker I needed, and we proceeded to talk for over an hour. 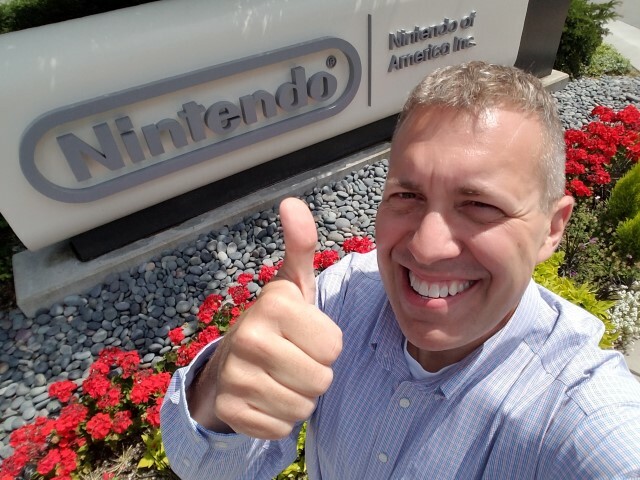 At the conclusion of the call, Billy confirmed his interest and willingness to work with us and we parted ways with him agreeing to help get us in contact with a few people that were either still working at NOA or had worked at NOA in the past that might have some knowledge on the game. At that point, it was “game on”. Billy and I wound up talking on the phone numerous times over the next couple of months and started to formulate a method to determine whether that lone Sky Skipper game still existed. If it did, we were determined to find it and try to get access to it. If it didn’t, then the project would go down in history (a burning effigy?) as a great ‘we tried’ effort and we’d take our cards and go home. Thanks to Billy’s connections from the past, had a couple of names to work with: namely Frank Ballouz and Jerry Momoda. Billy told us that if anyone could get us information on Sky Skipper it would be these two gentlemen. Billy had either worked with (or gamed with) these guys from BITD, so it seemed like a logical next step would be to reach out to them and see what would come of it. For those that aren’t familiar with these names, both are very important individuals when it comes to the history of NOA. Both Frank and Jerry worked there in days past with Frank being a business executive and Jerry being one of the premier game testers. 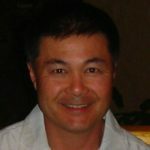 You can read more about Jerry’s past work at NOA on his blog – http://jerrymomoda.com/. It’s full of great insight and his perspective on his work in the coin-op industry over the years. Needless to say, he had a direct hand in what we saw Nintendo deliver to the arcades and ensuring that what we played was of quality. 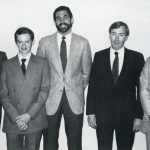 We had developed an introductory e-mail describing our intent with this project, some historical background info on us all and a list of 10-15 questions that we sent over to both Jerry and Frank and hoped for the best. To say I was ‘birddogging’ e-mail was an understatement… this was as close to the game as we had gotten to date, and it was no lie that we needed to judge their responses for what would be the eventual ‘big ask’. Jerry responded in turn and we worked with him via e-mail and was able to obtain a significant amount of historical information on Sky Skipper and some insight into why the game met the fate that it did and why NOA never approved the release. 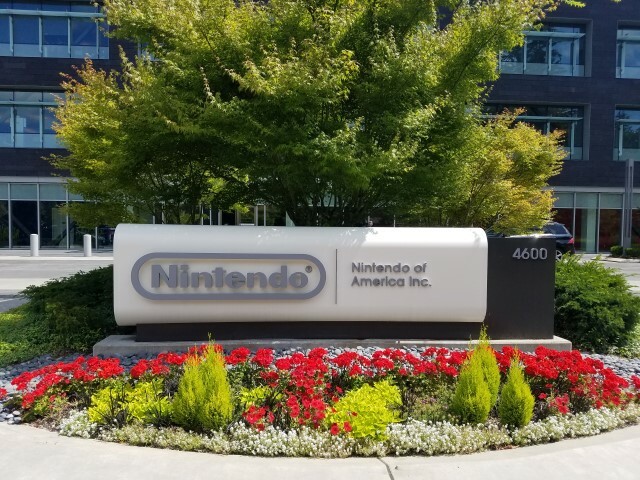 For those wondering, it it can be summed as the following two items – #1) poor earnings testing at selected testing locations and #2) internal play testing evaluation at NOA. Business – simple as that. Jerry’s responses and ongoing insight has helped to round out what we know of the history of the game and we will detail all of that in an upcoming blog post entitled “What we know about the history of Sky Skipper”. Suffice it to say, we learned a lot and we will share all of that with you as well. Frank provided a considerable amount of insight into how the game was handled at the corporate level and was able to provide us with our ultimate point of progress – a direct connection into NOA. Frank fired off an e-mail to this individual – we will call him “Stanley” as he’s not cleared us to reveal his identity – and we waited for a response. It took almost the entire month of May to get our initial response back from NOA – we were honestly beginning to lose some hope – but when we got that reply it was *glorious*. In the first reply back from NOA we got a lot: not only was Stanley interested in the project, but he confirmed that NOA still had that one, lone Sky Skipper cabinet on their property. He also confirmed that only 12 were imported to the US for testing and only that one remained. 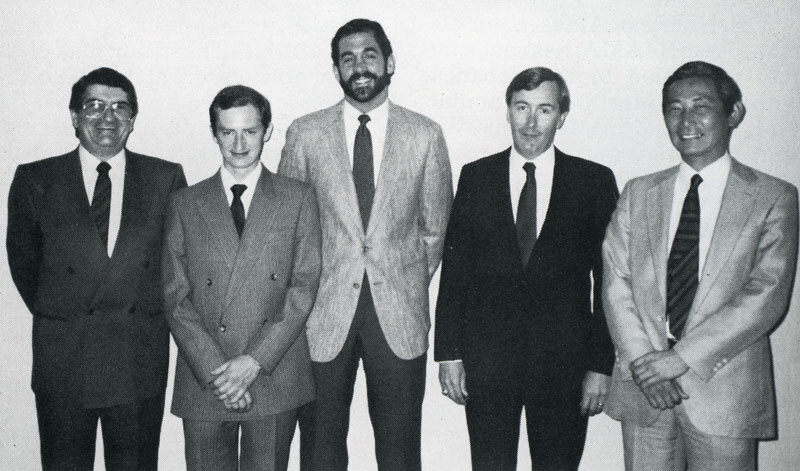 In the same note, we also were offered up pictures of the cabinet and needless to say – we about went bonkers. I didn’t expect so much on an initial reply – especially after being shunted pretty hard during my visit back in Feb. 2016. What this goes to show is knowing the right people can help to get crazy stuff done. At that point we had a dialog going with NOA, so we pushed forward as gingerly as possible. Stanley was willing to get us the aforementioned pictures and answer some questions, but we knew that in order to “do the project right” we needed to see that cabinet and handle the picture-taking (and scanning) ourselves. 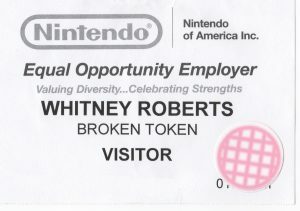 The last thing that any of us wanted to do was to wear out our contact at NOA with ‘back and forth’ requests for specific shots, etc. So, before responding back to Stanley, we sought council from Frank and Billy on how best to work with NOA given their offer and reached the conclusion that, if possible, we should attempt to come onsite and do the work ourselves as that would be the least-taxing route to go – if NOA would approve of us doing that. So we took Frank and Billy’s advice and responded back to Stanley and hoped for the best. It was a long several days before getting a response, but unbelievably, Stanley was good for us to come onsite and see the cabinet ourselves – all we had to do was get there. ‘EUREKA’ was about the only word I had for events at this point in time. I knew we needed to act fast so as not to belabor the offer and have it pulled back from us due to inaction. After some back/forth on the scheduling (and a few close calls related to ‘can we go’ types of discussions) we finally got everything locked in for a date and I was to get on a plane. For the next couple of weeks, I worked with a designee at NOA that managed the schedule for both Stanley and the person who managed the historical archives at NOA. In the same manner as Stanley, we’ll call this person ‘Pauline’ (see what I’m doing here?!?!) as she hasn’t cleared us to publicly disclose her identity, either. Upon my arrival at NOA, I was to check in at the front desk and I would then be greeted by both Stanley and Pauline and then escorted back to their archives where I would be able to work with the Sky Skipper cabinet. As Alex would say: “I was gob smacked”. 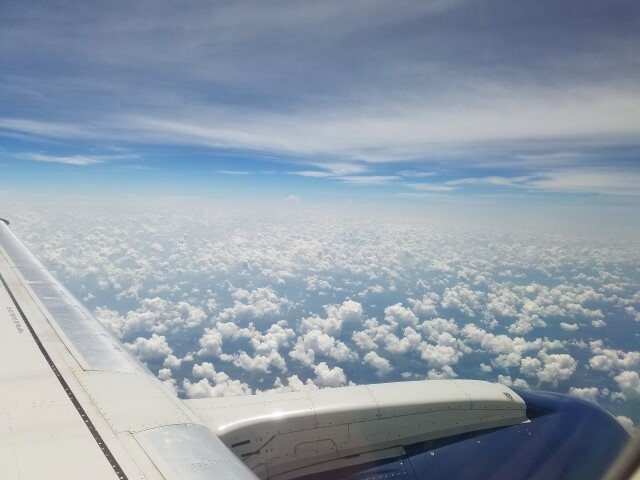 I’ve flown many, many times over the years, but this trip felt completely different. The anticipation of the unknown is the catalyst. It’s a beautiful shot as I approach Seattle. What if the cabinet isn’t complete? What if the artwork is butchered? What if it’s so early in prototype stages, it really isn’t the candidate we need? What if the cabinet looks nothing like the flyer? What if they say “yes to pictures, no to scan”, etc.? What if they turn me away at the door? I mean, we had a lot riding on this trip. It was impossible to nail down every detail related to those above questions, as well as others, ahead of the trip. If we wanted a sure-fire way of getting uninvited to NOA, asking about 15 more questions – all very detailed – would have been the exact way to make that happen. No, some things you just have to do on faith and this is one of those times were we had to take what we knew and work (hope) for the best. So I pack up my belongings and walk into the lobby at NOA headquarters, Redmond, WA. If you’ve never been to NOA, it is a treat. 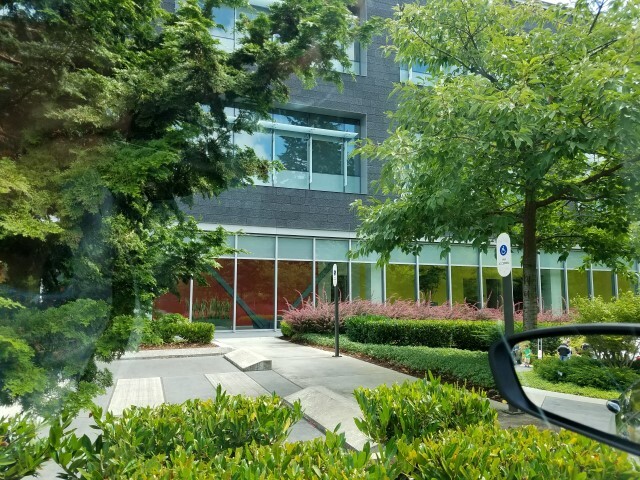 The campus is beautiful (it’s located right next to the Microsoft campus – both are immaculate) and just being in the building knowing I’m standing in some of the arcade ‘hallowed halls’ – as well as what is getting ready to happen – is pretty mind-blowing, actually. It’s beautiful – lots of greenery and very well-maintained. I’ll never throw this away. Killer keepsake for life. I was then instructed to await the arrival of Stanley and Pauline. I made a quick call to Alex and blabbered a bunch of crap that is likely very unintelligible now that I think back on it. He wished me luck and I the only thing I could add to the conversation is that I wished he was here to experience this with me. We covered off on any last-minute to-do items as I was to have about 2 hours at my disposal so I needed to make it all count. I knew that once I started working with the cabinet the time would go QUICK (and it did). We went through the mental checklist of all the items to bring…camera and charged batteries (check), scanner (check), laptop power supply (check), extra-long USB cables (check), Takigen key for the cabinet… DAMMIT. I forgot to bring a key! I couldn’t believe it – I felt absolutely deflated. Months of prep and I walk out and forget the one item that would have been critical to getting us into the cabinet. I had no idea if they would have this key on hand and I pretty much felt like I had already (partially) failed. Alex pumped me up with lots of “it’s alright, mate” (and it worked quite well) so I tried to put that gaff behind me and keep the main thing the main thing. 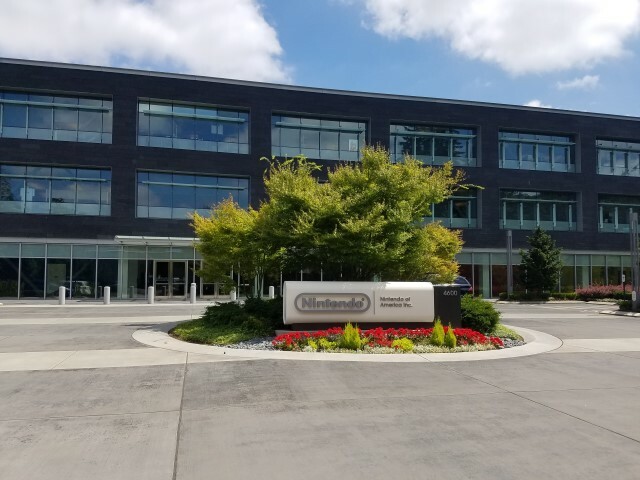 After a 10-minute or so wait, I was greeted by Pauline – she was extremely nice and as it turns out – had been at Nintendo for a LONG time. She is in charge of their historical archives and some internal logistics, so it made sense for Stanley to get the two of us connected. 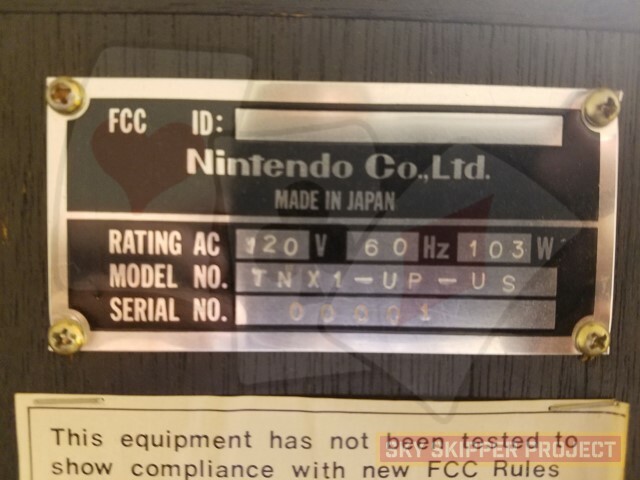 Stanley informed me that Nintendo doesn’t really pay much attention to the ‘pre-NES’ timeline, so there’s little-to-no interest in the arcade-era legacy, and much – if not all – of what Nintendo has in their historical archives is due to the nostalgia of Stanley, Frank Ballouz and others at Nintendo that sought to preserve the history – not the corporation itself being overly interested in that preservation. 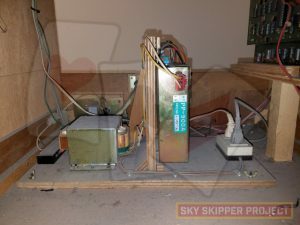 I was a bit disappointed to hear that but totally get it – we’re caretakers of items that are 35+ years old, make no money for the company any longer, and are of interest to only a select group of the population…I’m just glad Stanley decided not to toss out that last Sky Skipper! Stanley, Pauline and I discussed what was to happen next and he then shook my hand and turned me over to Pauline for the duration of my trip. She then escorted me out of the main building and we walked around the campus for a bit until we came to an unmarked building, which is where the archives are located. I was a bit surprised – the building had lots of people there and when we walked in I could see that it doubled as a shipping/receiving warehouse as well – lots of activity and lots of product moving around. Pauline walked me down the first floor of the building, out into an open warehouse floor and then to a side room which was darkened with pulled shades. We walked right up to the door and she said “we pulled it out of storage for you – you’ll have some time with it here”. Pauline said that she’d stay with me during the entire duration of my time with the cabinet, so I was never left unsupervised – which is actually good. I didn’t want something to happen and I then be found liable due to circumstance. So I made sure she was OK with me taking 60-90 minutes to scan the cabinet artwork and document it to the best of my ability and she said “It’s all yours”. She swung open the door, flicked on the light switch and there it was…. I didn’t really know what to say when I first saw the cabinet. I had truly never seen any Nintendo arcade game that looked quite like this. It made an immediate ‘Yeah, I’m Nintendo just like Donkey Kong is’ impression and I was blown-away for the opportunity to do what Alex, Olly and I had talked about for so long – but doubted would ever truly happen. I was going to document and scan the only known Sky Skipper on planet earth. Let me get this out into the open first and foremost – The artwork on this game is BEAUTIFUL. Despite still being in the obvious prototype stages of development (check out the CPO – it’s far from finished) the game is a sight to behold. Of the artwork on the cabinet, the side-art is definitely the closest to being what I would consider ‘production’ ready. It has the attention to detail and rich color pallette that you would expect to find on a Nintendo game. The bezel and the marquee are very close to that same level of finish, but have a bit of ‘flatness’ to them and I suspect it is due to the fact that many of the side-art elements are pulled and repeated on those two pieces. That being said, I was surprised that it had a finished CPO instruction card and bezel sticker. I proceeded to unpack my equipment and set up. Remember the whole deal on the forgotten Takigen key? Well… that was the very first thing I addressed as I walked around the cabinet and fortunately the back and the coin door weren’t locked…*whew*…disaster averted. As a good friend of mine often says – “Better lucky than good” and this was indeed a prime example of that. I started by taking as many pictures and shots as I could think of taking – both inside as well as outside the cabinet and then started the scanning process. Pauline stayed with me through the entire process and was great to work with . While I was scanning the cabinet artwork, she was busy looking up any additional information she could find on the game. I was really pleased to find that both her and Stanley were eager to help us complete this project and I never got any feeling from either of them that we were pushing Nintendo past its comfort zone. I genuinely felt like they were interested in our interest in the game and wanted to see us succeed in helping keep this game alive. Although we can’t release the full scans here on the website (we are, after all, reproducing the artwork package) you can see some of the overall cabinet details and design below. Revel in the glory of full details on a 35+ year old, practically never-before seen game! This is what I saw when I walked into the NOA Archive meeting room. The game was powered on, but wouldn’t boot properly. It could definitely stand a shotgun service on the monitor as well. The much sought-after serial number plate. Now we know that ‘TNX1-UP-US’ is the magic code and this machine is indeed the first of its kind. It’s good to be number ‘00001’. 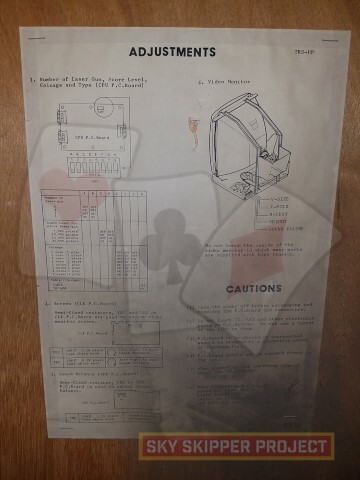 The back door sheet was Radarscope (note the ‘TRS’ indicator in the top right of the sheet). I never thought I’d bear witness to this – running a scanner against unreleased artwork at NOA. 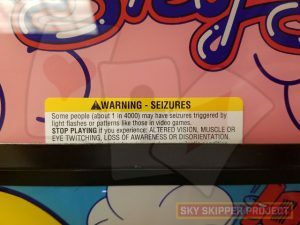 On-location ‘testing’ stickers that had to be installed as warnings while the game was under evaluation. The monitor bezel was constructed in the same manner as the early Donkey Kong bezels – a ‘2-layer sandwich’ where the tinted plexi is applied behind the layer with the printed artwork. Notice some of the errors on the CPO in this spot – clearly this artwork wasn’t finished. 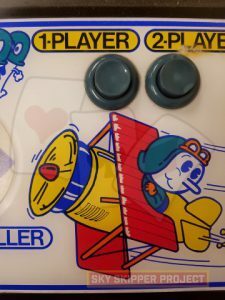 This version of Mr. You’s plane doesn’t match the version on the rest of the cabinet – notice the skin tone, clothing and color differences at the front, back and sides of the plane. 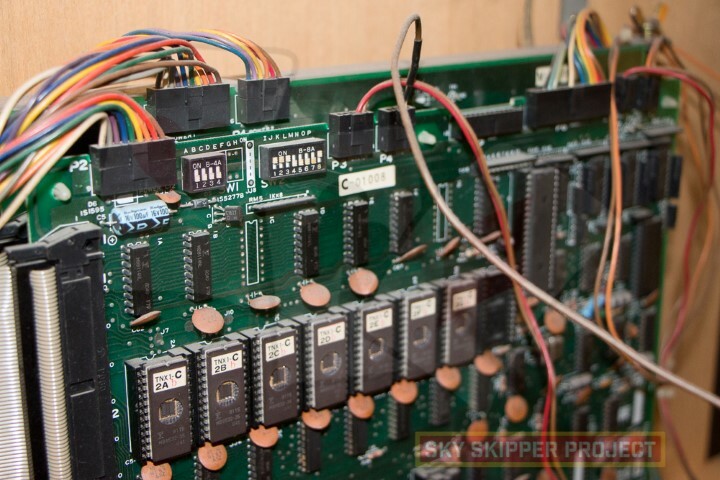 DIP switch settings as they were found. 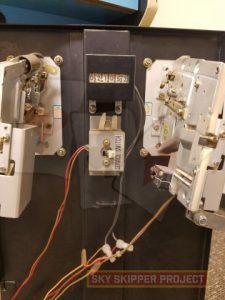 Shot of the wiring connectors from the front of the cabinet looking through the coin door. 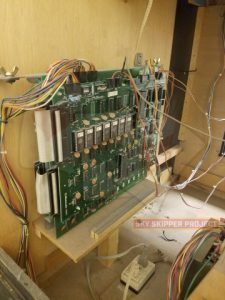 Shot of the PCB stack from the rear of the cabinet facing forwards. Over 21K on this machine – I’m going to bet that number was rang up over the course of a couple years, and it has set frozen at that number for a long, long time. 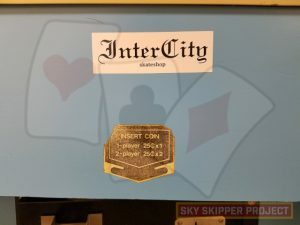 Yes – I did try to coin up the game, but it wouldn’t work. The PCB wasn’t booting properly. 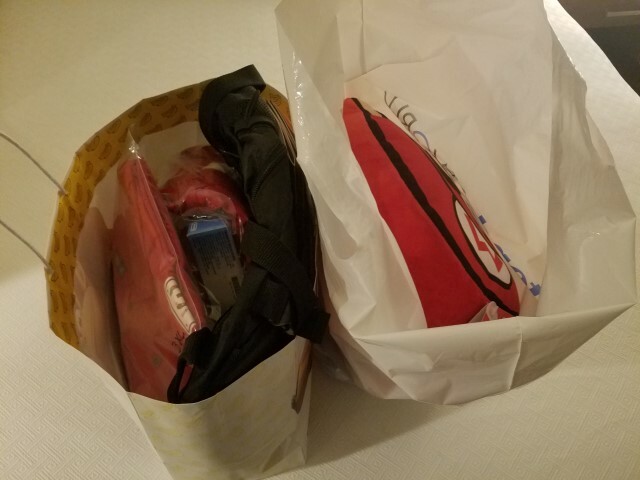 Bags of swag, and inside was all kinds of shirts, pull-overs, a Wii backpack, Mario pillow and even a special edition new 3DS XL. As we would say here in Kentucky… Absolutely AMAYZIN’ the kindness and interest that these ‘arcade champions’ deep inside NOA demonstrated. It was a whirlwind day – there are parts that I’m inevitably leaving out…those details will continue to surface over time and I’ll update the blog post accordingly. 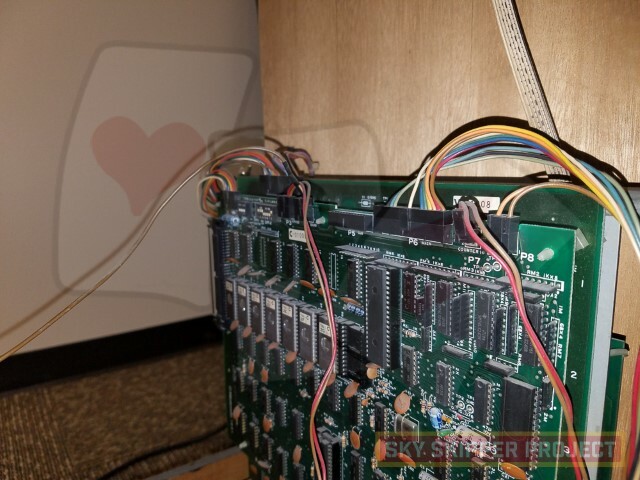 In the end – with the help of a global team of folks and a couple of very understanding arcade fans at NOA – we did what most would consider to be impossible: we went into the archives at NOA and pulled a historical piece to use for restoration reference. I’m sure it’s a first and I’m glad it was done with Sky Skipper. If you made it this far, then we applaud you – it was a lot to work through. We trust it was well-worth the time, however. It’s a glimpse into what we are now working with to help us complete the project and you can be there is lots more to come. If you have another 10 minutes to burn, check out this video that Alex posted on his Youtube channel – it’s his perspective on this story and is a great companion to what you’ve just read. Redraw all the artwork based on the scans – as of this writing, we are almost done with this…more to come in an upcoming blog post! Reveal the games and take them on the road! Love this story and will be tuning in to the next installment. I will be bending Alex’s ear about it all too! Awesome Vic! Thanks for the support – looking forward to listening to your interview w. Alex on your show! Simply amazing. Speechless. The stuff of legends. Hey Neil – thanks for the kind words. I’m not sure about legends, but we’ll take it! LOL. How about ‘devoted to the point of no return’?? Fantastic stuff gents – this was a great read. Your reward is very well deserved, and hats off to NOA for playing ball. I am looking forward to the big reveal when it comes! 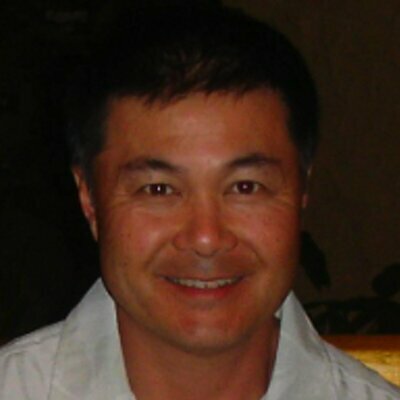 Thanks Tony – we really appreciate your support and coverage on your site. Big things still to come and the reveals will be historic! Thanks for the info. I’m going to reconcile the DIP switch settings and get that info here on the site. Do you have a link to the UKVAC thread where you have that documented? We’ll give you full credit. Shame that Radar Scope sits there unloved. Would love for someone to scan a cockpit cab’s art, there are once or two about still I think. Honestly – I doubt they do. We have it on good (ultimate) authority that all other Sky Skipper cabinets were destroyed. From what we have been told, what you see on this site is what (all) there is. 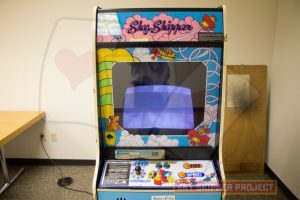 Not even a Sky Skipper cocktail cab left 🙁 .Whitney I was wondering and you may know the answer, – did this game start out in development before Donkey kong? It was a theory I had. 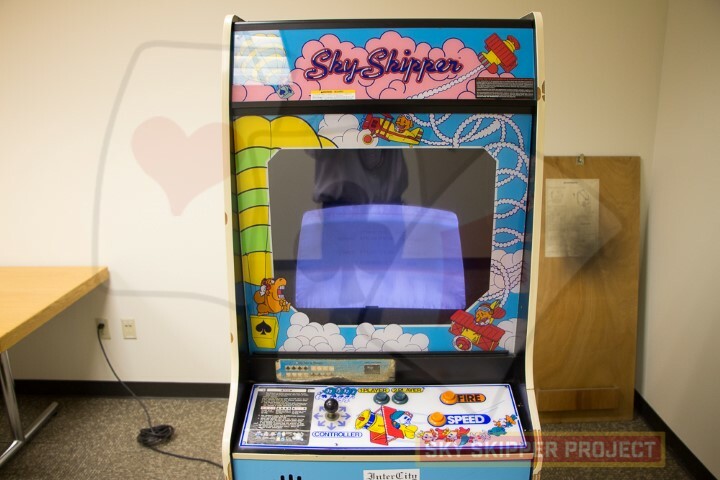 As we know there was Radar Scope and the next game Nintendo planned I think was to be Sky Skipper, but because Radar Scope failed Nintendo quickly brought in a (seperate?) team (including Miyamoto) to make Donkey Kong, what do you think? 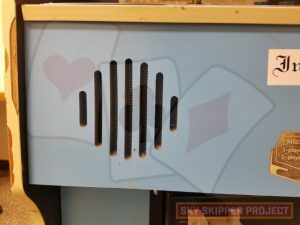 I also think the Donkey kong art work was designed for a red cabinet (in other words for Radar Scope’s old shell) and the blue we know today for DK was an afterthought as that colour (sky blue for the sky!) was created initially for Sky Skipper alone. I am still reading through this lengthy but great post, but some family stuff calls and I will have to finish it later. However, I wanted to throw a shout-out to Cary Chaney! I have been to his arcade many times before it closed this past May in Cincinnati. 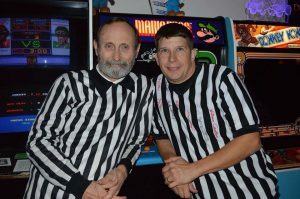 I was fortunate enough to be at The Place the last day it was open and got to chat to Cary a bit and let him know how much he meant to the Cincinnati arcade scene. I also got to see Billy and Walter Day show up and surprise him on that last day. Awesome way to see The Place out! Anyway, if you read this, Cary, awesome job on helping these guys out with the project. You continue to give back to us even after The Place closed! Good deal Kevin! Glad to see another Kentuckian following the Project! Yes – Cary is a great friend to the hobby and has helped me out personally on more than one occasion…great guy all around. I’m glad you were able to be at his arcade on its last day. I’m sure it was equal parts fun and sentimental. Brilliant read – quite an adventure. Well done to all those that made this happen. Thanks! There’s still a way to go, but it’s been good progress thus far. Whit, this story is amazing! What a thrill to experience. I am so envious!!!! Congrats. Get this done by LAX please! Hey Jeff, glad to see you’ve enjoyed the ride so far. It was quite the experience and we were bursting at the seams for months to detail it all, but it was the type of story you had to tell all in one sitting, and it had to take its natural course as well. As far as LAX goes – I’m hoping I can make that happen. No promises and nothing official, but it would be ideal. More to come on that. Amazing, simply amazing. 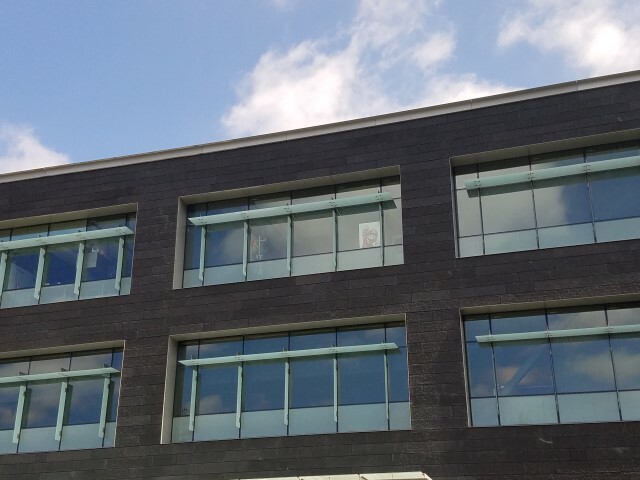 Guys, your hard work and dedication along with a good helping of luck and good people with connections got you where you need to be on this project today. Bless you guys for doing this. Its your passions for the hobby that we surely love. I bet NOA has been bombarded with offers for that Sky Skipper after this article, lol. They really should keep it, fix it, and put it up in their museum for all to see IMO. Hey Sasha – thanks so much man! It’s been quite the journey but the good in everyone has come through and we’ve been able to make some wicked-cool things happen because of it. I hope they do eventually get #00001 fixed up and running – it deserves to be fully-functional and a showpiece for sure. Oh my god. What a fantastic story and project. I would love to see a video documentary made for this project in a similar style to King of Kong and Man vs Snake. It has all the right ingredients.